When India was seen as a country that manifest deeply rooted patriarchal values in its tradition and culture, there was also another side of India where women despite of such symbolic patriarchal repression broke its barriers and travelled across the black waters. However such accounts of travel by Indians, especially Indian women are missing in the burgeoning scholarships of South Asian Diaspora, Geography and History. Shompa Lahiri in the book tries to catch certain accounts of men and especially women travellers who travelled across the ‘West’( Britain, America, and Europe) during the 20th century and opens up questions on new perspectives on the connection between travel, embodiment, and racialized as well as gendered and classed identities. As Parama Roy argues that there is a huge range of work in mobilities and India Diaspora, however the feminist lenses from these works are heavily missing. Therefore Lahiri taking account into these criticism and drawing from feminist and post colonialist theories tries to pull out a coherent piece of work that would reflect not only on gendered accounts and histories of travel but also included neglected role of India women within mobility and cosmopolitan modernity. All the five chapters of the book talks about case studies of South Asian women traveller who travelled across the sea in different time period of twentieth century with different visions may it be education or war, but managed to maintain similar patterns of phenomena like ‘passing’, ‘gaze’, and or ‘sly docility’. The first chapter gives an account of ‘Olive Christian Malvery’ who was an Anglo-Indian by her ancestry and travelled to Britain in early 20th century. Here the author tries to see the possibilities of presenting ‘nativeness’ in imperial cosmopolitan London. Her ‘nativeness’ was reflected in varieties of ways. As for example one was her colonial Indian ‘native’ identity and other was as a poor flower selling Cockney girl as well as a society’s lady. She was a journalist by profession where her performance as a poor cockney girl tried to bring out the conditions of poor London into public attention. This chapter brings into light Malvery’s many identities which she created through Masquerades, her acting skills and also her hybridity that was embodied through photography, mixed descent, skin colour, dress and voice. In her book Soul Market she talked of her ability to move not only cross borders but also through class ‘up and down in the social ladder’. Thus Lahiri argues that on one hand Malvery was able to challenge the oriental notion of ‘nativeness’ by travelling out of the colony where as she reinforced her ‘nativeness’ in imperial Britain by staging herself as Cockney for a metropolitan audience to consume. In the second chapter Shumpa Lahiri explores the themes of mobility, performance and domesticity through the comparative case studies of Dhan Gopal Mukherji and Parvati Athavale who both travelled from India within America in early twentieth century. Here she explores the relationship between ‘Homing and Roaming’ that is reflected in the autobiographies of these two travellers. The experiences and context of both the travellers were different because Mukherji being a male and a high caste Kulin Brahmin was definitely more privileged to be mobile than a widowed high caste Athavale at home. But both Athvale and Mukherji worked as servants in European household and institutions for their survival contradicting their high caste status and given gendered identities. Therefore juxtaposing their positions Lahiri asked what the concept of ‘at home’ in America might have meant to them. The third chapter highlights how Indian colonial migrants changed their identities to avoid surveillance and to have access and into diverse imperial and national spaces of the West. It emphasised on how mobile masculinity, mimicry, performance and re embodiment were deployed in imperial zones. Lahiri here discusses cases of Indian nationalist and political criminals of British Satyandranath Chatrejee and Virendranath Chattopadhyaya(Chatto) who travelled various parts of Europe and British empire in disguise with agendas that were both national in ‘ideology and transnational in operation’. The fourth chapter talks about India women who travelled to Europe during mid twentieth century and were positioned both as ‘mobile exhibits’ and ‘seeing subjects’. Using Fatimah Tobing Rony’s concept of ‘third eye’ she tries to explain how Indian women travellers were taken as objects to be observed as well as observers. Travellers like M.C.Kuttan Nair(1908-1997) also appropriated the concept of ‘third eye’, ‘gaze’, ‘peep’ in her writings while giving the description of Europe tour in 1934. Nair’s accounts on travel reflects that she and her fellow women travellers were more subjected to ‘gaze’ during 1930s than those like famous Parsi social reformer Dosebai Cowasjee Jessawalla, who was one of the first Indian women to receive a western education. Another important aspect highlighted by Lahiri is the concept of Photographic gaze. During 1930s the press used photographs of Indian women travellers as embodiment of European modernity. Finally Lahiri emphasizes on Nair’s another concept ‘walking zoo’ which indicates the engagement of colonial anthropology to zoologise colonial subjects. The fifth chapter gives tragic accounts of state sanctioned covert movement of secret agents during the World War II. This chapter through the case study of Anglo-Indian agent Noor-un-nisa Inayat Khan, author tries to emphasise how bodies, identity, mobility and performance creates meaning cutting across race, nationality and gendered notions of masculinity and femininity. This shows how Indian womanhood was reconstructed not just within the continent but also outside India. Khan as a female British agent in France not only claimed masculine nature of courage but also used masculinity as a tool. The work on Indian mobilities in the west therefore opens up new horizons for transnational and diasporic studies. The noted feature about this work is that it shows how through mobility identities of gender, performance, and embodiment were created over space and time in diverse geographical and historical set up. The book has talked about mimicry and performance in almost all the chapters. For instance we can see in case of Malvey, Khan or Chatto how there were constant efforts to adapt another persona in order to hide the real persona and go undercover forming a complete different identity. This also identifies the importance stressed by Goffman, of actors changing their performance to suit different audience. The book is a product of good research and heavily draws from the archives and theories of disciplines like sociology, geography, history. It is appreciating that the author was able to trace back some valuable accounts such as photographs and police records from imperial government. However there are possibilities of more exploration. All the case studies cited here were of elite travellers from South Asia, whereas there is a lack of representation about the less privileged travellers who could be labours, soldiers, preacher or pilgrims that might have travelled through various course of time. As for example noted Assamese writer and Padmashree awarder Indira Miri despite coming from a marginal lower caste background made her way to Edinburg University of Scotland on 6th April 1945. Moreover the book can also explore broadly on the relations of class, caste and gender and see how the interplay of these categories helps in identity formation both at India and in the West. India was known as a strict patriarchal country where mobility of women was highly constrained. Therefore it would also be interesting if the book tries to talk of the ‘gaze’ of common Indian public towards women travellers of twentieth century. Lahiri, Shompa. 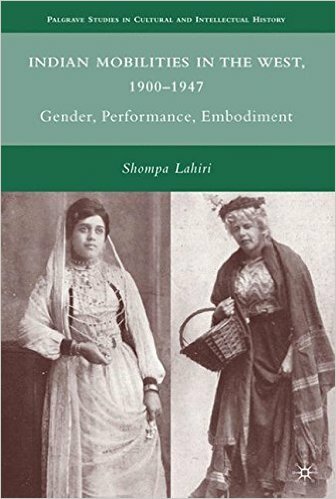 Indian Mobilities In The West, 1900-1947:Gender, Performance, Embodiment. United States: Palgrave Macmillan, 2010. Walkowirz, Judith. The Indian Woman, the Flower-Girl and the Jew: Photojournalism in Edwardian London. Victorian Studies 42, no. 1 (1998): 3–46.